To be able to export your geofences you need to have them into Groups. Read more about this here. 1. 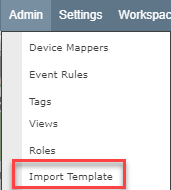 Inside the application go to Admin -> Import Template. 3. Refresh your window and your Geofences should appear now under the Geofences tab as usual.